When you step into Sophie’s home in the heart of Bronx, NY you don’t feel like you are in the middle of a bustling and busy city. Instead, you walk into her quaint apartment and feel a therapeutic calmness wash over you. The faint and lazy scent of incense hangs in the air as you hear the soft hum of the window AC cooling the hot City day off of you. Every corner of her apartment is covered in living greenery which breathes a revitalizing breath into the atmosphere. There is a sense of organic and hand-crafted purpose to the items she surrounds herself with in her home; much like what you see reflected into her own jewelry making. Sophie is a farm girl in the heart of one of the busiest cities in the world, with a thriving business and an imagination for whimsical and charming adornments. This is the first of what I would like to be many, in my series of interviews with artistic creatives who inspire me. Often all we see is the finished product, but as a creative myself, I know there is so much more to the story that is hidden behind the scenes. I want to shine a spotlight on this hidden world and give you a look into the mind of some of my favorite artists. Read on to see the the full interview with the creator behind Sophia Faye Jewelry. · How would you describe your art in 3 words? · Does your personal style relate back to your artwork in any way? My personal style is actually much more groovy than the work I produce! Since my jewelry and accessories are meant to be long-lasting and are heirloom quality I try to add a timeless, clean feeling to them. Especially the baby bangles, anklets and toys, I really strive for them to reflect back to simpler times when people had fewer possessions that were more valuable and truly treasured. · What inspires your art and gets your creative juices flowing? I have an incredible group of jeweler friends and a network of makers who are my creative life-blood. I seriously don’t think I could do this without them! They’re so brave, creative and supportive. We push each other to be better and try new things. Anyone thinking about starting a creative business- find your network! They’re the only ones who will really understand all you will go through. As far as creative inspiration goes, much of it comes from my travels- for instance my baby anklets and bangles are inspired by South-Asian culture. When I lived in India I noticed that so many children- no matter their social or economic status- were adorned with silver on their wrists and feet. It conveys this sense of love and attention to detail that touched me deeply. I also have been in childcare for many years so I know how tough children’s things need to be, but I also believe we can give children valuable gifts to teach them how to treat a precious possession. · What types of materials do you work with most? Since I want my pieces to last I steer clear of plastic. I don’t even have any plastic in my packaging! I use silver, raw wood beads with a homemade wood finish of coconut oil and beeswax, and cotton ribbon. All of these can go right in a baby’s mouth or against their skin with benefits! Silver is antibacterial and antimicrobial. Wood beads are natural and are hard enough to not give baby splinters but have a very cool texture and taste which babies love! Even coconut oil is anti-inflammatory. Each element of my work has been considered and carefully chosen. When I’m not working as a nanny I do some yoga and have my breakfast (well breakfasts now that I’m pregnant). I sit down at my studio, which is a tiny corner of my living room and work on any open orders I have. Once I get those orders made and packaged I take a break to walk the dog then I come back and either brainstorm and sketch or try to flush out some already-existing sketching into models. Some days I spend a few hours running back and forth from the diamond district to pick up castings, chain, displays or any other supplies I need. I do find it challenging to keep myself focused when I’m in my living space so I would love to eventually get a studio somewhere else in the city. 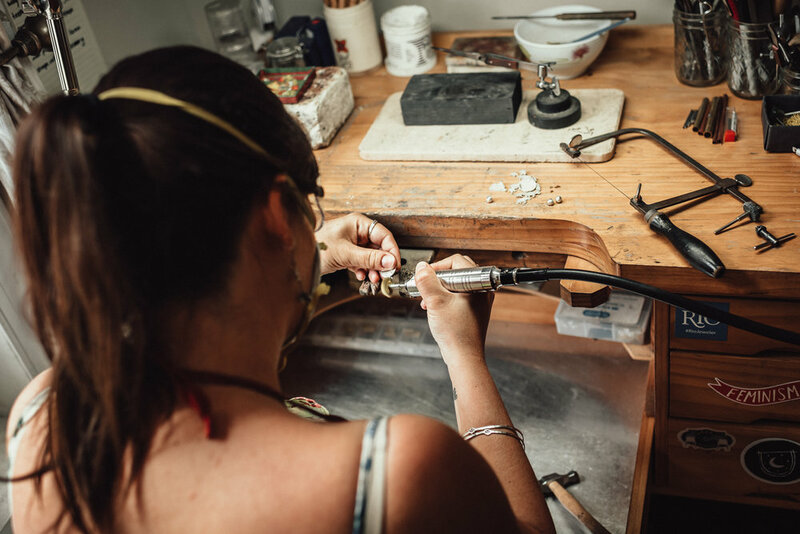 · How were you introduced to jewelry making? I took a small metals class when I was studying fine art at NYU and I was hooked! The teacher did not particularly like me but I thought all the fire and hammering was just too cool. Plus I loved the idea of functional art. I still find it so wild that people want to wear something I created around all day! I went to FIT for their jewelry design program and have been evolving my line ever since. 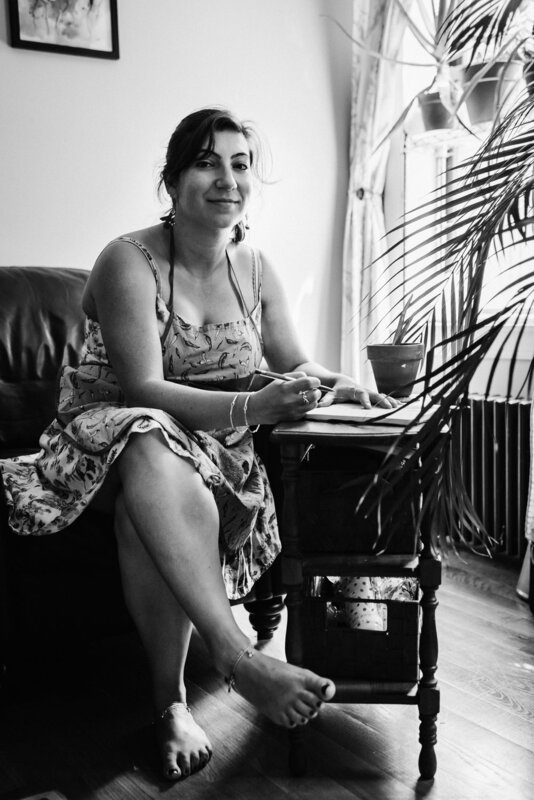 · Does living in New York City impact your work? Yes yes yes! There are so many unbelievable museums and exhibits and artists in this city, whenever I get into a slump I just need to walk out the door and into a craft market or a gallery and immediately I’m rejuvenated. This really is a cultural hub and the exposure to so many forms and facets of creativity really keep me feeling alive. · If you could set up your dream project, what would it be? I’m a 6 year old at heart so I would love to make a really fabulous fairy crown! I’m talking sparkly jewels, twinkling gold and swirls all over! More realistically I love collaborating with other artists where we trust each other and give one another creative freedom. Anyone interested hmu for real! · What's been your favorite piece to create and why? I made this bib necklace in collage with butterfly wings in resin- it was so rad! But more importantly it was such a great learning experience because I had never worked with resin before so it took a few tries and few sadly wasted wings before it turned out just the way I liked it. It was also a huge flashy necklace that was more of an art piece than functional jewelry, I kind of loved that! · What's next for you? I’ve got a baby coming in October so the mom thing is next. It’s a boy but I will definitely be putting anklets on him anyway! I’m working hard on the business so I’d love it to become more full-time so I can stay home with the baby and work on my own schedule. Fingers crossed! · Describe your artwork from spark of idea to finished piece. I would say 90% of my ideas either never make it off the page of a sketch book or turn out to be not-so-great in real life. I think this is true of most artists’ work! Once I redraw a sketch enough times to figure out the mechanics behind it, I make a 3D model in brass or special jeweler’s wax. I bring the model to my local caster who, through the “lost wax casting process”, makes a rubber mold and as many replicas of my piece in whichever metal I choose (usually silver). Back at the studio I clean and polish the pieces, assembling and soldering as I go. The rubber mold enables me to cast the same piece again and again! It’s quite a process from start to finish and often takes a few weeks, but it is so rewarding to have a shiny new treasure spring to life from an idea in my head. · What are you trying to communicate with your art? I want to see people’s consumer habits revert back to when we bought fewer things that actually meant more. We all have way too much stuff these days; too many toys, clothes, jewelry. Eventually they break and end up in a landfill. I think people are starting to realize how unsustainable this habit is and how we are slowly drowning ourselves in crap we don’t need. I hope my pieces will be treasured for years and possibly even handed down through generations. I’d like my art to be treasured and cared for, given with meaning and true value.